Across the nation, news media outlets are reporting that pedestrian deaths are at a 30-year high. This comes at a time when in Sacramento we are seeing a rapid increase in the number of fatal vehicle – pedestrian collisions in the first part of 2019, including five tragic collisions across Sacramento County this past month. While these collisions are still under investigation, it is clear that behavior, influenced directly by roadway design, played a large role in each. Nationwide, there is speculation that the precipitous increase is due to distracted roadway users and larger vehicles designed to protect drivers. While this may well be the case, we know in Sacramento through the data-driven Vision Zero traffic safety program that the primary causal factor in fatalities is speed. Traffic speeds are driven primarily by the way that we design our streets to accommodate for mostly unimpeded vehicle travel. 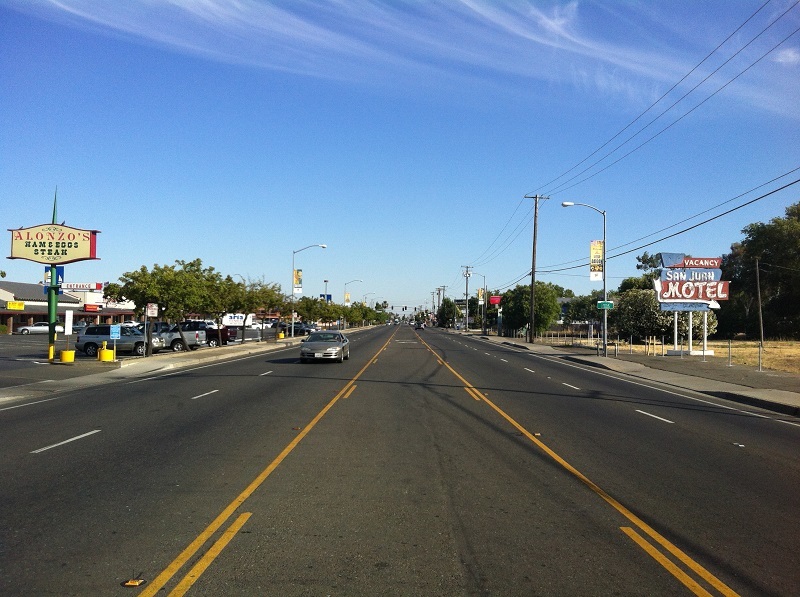 We also know that in Sacramento, a disproportionate number of fatal pedestrian collisions occur in disadvantaged communities, where roads like Howe Ave, Power Inn Road, and Marysville Boulevard function more like local highways than neighborhood streets. These are also often the communities where people rely the most on alternatives to driving like walking and biking. While telling pedestrians to use a crosswalk is good advice in theory, in practice, there are countless roads in Sacramento where safe pedestrian crossings are over a half-mile apart. Research shows that most people will walk at most 300 feet to the nearest crosswalk. When news articles report that the victim had “crossed outside of the crosswalk” we are often not getting the full picture. Additionally, the increase in pedestrian fatalities comes at a time when pedestrian and bicycle travel is leveling off and driving is increasing. In roadway planning, we know that safety happens in numbers – the more often pedestrians and bicycles travel on a road, the safer it is. Pedestrian and bicycle volumes are directly correlated with facilities like tree-lined sidewalks and protected bike lanes that separate vulnerable users from motor vehicles. However, Sacramento communities have not seen a significant, nor proportionate increase in the amount of bicycle and pedestrian facilities that would provide viable and safe transportation options, especially for those who rely on alternatives to driving. In order to truly reverse the trend on what has become both a national epidemic and local crisis, we must rapidly invest in transformative roadway safety projects across communities that better balance the needs of pedestrians and people on bikes with motor vehicles. While the gas tax has significantly improved our ability to invest in our roadway system, we still have nowhere near the amount of funding needed. In Sacramento, our transportation budget is 1/3rd that of similar sized communities like Oakland, meaning that we must rely on slow-to-come competitive grants to make change. To rightfully treat roadway deaths as a public health emergency, we must shift our approach from being reactive to proactive. This means investing significantly more locally-controlled funds into projects like road diets, bicycle facilities, pedestrian crossings, and closing sidewalks gaps to prevent further tragedy sooner than later. Preventing unnecessary deaths should not be a question of political will. It is also important to note that the benefit of designing communities for people, not just cars, doesn’t stop at making our roads safer. Doing so attracts more local business investment, leads to improved health outcomes, and helps us fight climate change. Here at WALKSacramento, we work across several communities and with countless partners to proactively address roadway safety, quality of life, and transportation justice. Through Safe Routes to School programs in six school districts across the Sacramento region we work with families to instill safe travel behaviors early on. The focus of this work is to organize schools, neighbors, and students to demand action toward creating safer streets. Through partnerships with local agencies and community based organizations, we work to make the region more competitive for necessary transportation dollars. Through our community based planning efforts we’ve helped to secure over $18 million in state and federal grants to improve mobility, construct off-street paths, and make transit more accessible. Working with a coalition of diverse community-based and environmentally focused organizations, we are advocating for a County-wide sales tax measure that prioritizes traffic safety and viable alternatives to driving including regional trail and rapid transit networks. Join us in writing to your local elected official urging greater investment of general fund dollars into roadway safety, especially in communities that are most disproportionately prone to fatal collisions. While the City of Sacramento’s Vision Zero plan is ambitious, the City has committed nearly none of its own money for implementation. Sacramento County does not have a Vision Zero program. Make a personal commitment to driving, biking, and walking safer. There are proven, immediate steps that you can take to making our streets safer for everyone. Put your phone away, slow down, and acknowledge that when driving, other people’s lives are in your hands. To learn more about our mission and advocacy for safer streets, visit www.walksacramento.org.